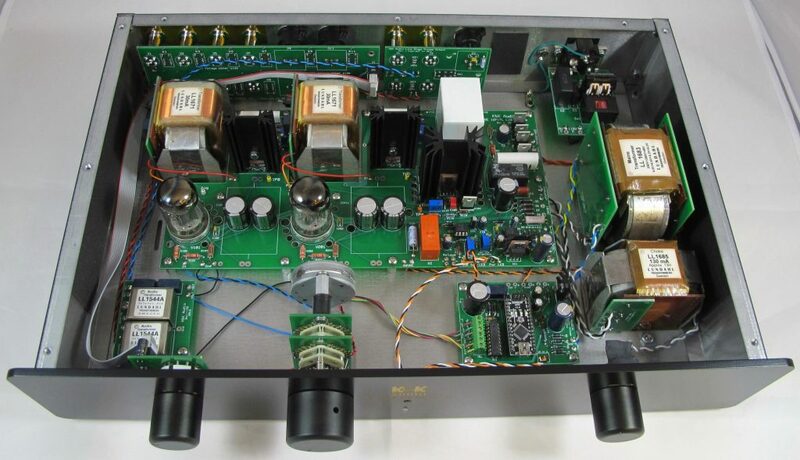 What’s a “Line Stage Preamplifier”? If you are old enough, you might remember the Mir Space Station. It was a Russian space lab, not too dissimilar from the NASA SkyLab of the 1970s. Mir was a host for some joint Soviet/NASA research missions. The Russian language word for “peace” is “Mir”. Given the origin of the 12P17L tubes, which are a large part of the excellent sonic performance of this product, and our current international political situation, I thought it was an appropriate reference to the not-so-distant past. What’s so special about the Mir Line Stage Preamplifier? The Lundahl transformer coupled gain stage delivers 8dB or 14dB of gain using the indirectly heated “sibling” of the 4P1L, the Russian 12P17L. Indirectly heating the filament saves space and cost, but still offers the wonderful clarity and dynamics, with a less “vintage” sounding tone than the 4P1L. The power supply is choke filtered using the “common mode connection” of the Lundahl power supply choke and each channel has its own shunt regulated high voltage supply. Four stereo unbalanced inputs are accommodated; balanced input capability can be added as an option. Stereo unbalanced and balanced outputs are standard. Optionally, the outputs can be split between separate unbalanced and balanced groups to drive amplifiers of different input stage configurations. Remote controlled volume by means of a motorized stepped attenuator and mute are offered as options. What differentiates the sonic performance of the Mir Line Stage Preamplifier from other designs? Well, I haven’t heard all other designs, so I can’t really answer this question. But I can write that what I hear in my own system with the Mir in it is compellingly more real sounding than other line stages I’ve designed and built. My reference for live acoustic music is primarily classical, most often the North Carolina Symphony Orchestra performing in the excellent Meymandi Concert Hall in Raleigh, NC. When I develop an audio product I desire to hear reproduced instruments and voices that have tone and timbre similar to those I hear in the real space of the concert hall. I want the dynamics to surprise me like they frequently do in a live concert of a work I am not so familiar with. I work to get the sense of space that is heard in a real performance venue. If executed correctly these things all work together to create what writers call the “willing suspension of disbelief”, meaning that you begin to imagine yourself in the venue instead of your listening room. The Mir does this better than any line stage preamplifier I’ve ever auditioned. A shorter (and grander) way to say all of this is that the Mir breathes life into recorded music. The Mir Line Stage Preamplifier is a single stage, single-ended triode design that is coupled to the output jacks using a Lundahl transformer that also serves as the load for the anode (plate) of the tube. The Russian 12P17L tube used is actually a pentode, but is connected as a triode for use in this preamp. It is a relatively low plate resistance tube, so that it is quite capable of driving any sane power amplifier input load through the output transformer. The combination of the 12P17L and the output transformer also has moderate gain (switchable to 9dB or 15dB), so that the Mir offers flexible integration into a wide variety of audio systems. The power supply is just as important as the amplifier circuit itself. After all, an amplifier is just an audio signal modulated power supply! After some mains power filtering is an oversized Lundahl power transformer that generates all of the raw voltages needed for the Mir. The high voltage supply feeds an LC filter network and is further processed to remove noise by a pair of shunt regulator circuits, each dedicated to one of the two channels. The 12P17L filaments are heated with a passive DC supply for the low noise. In the case where balanced inputs are specified, the signals from these inputs are routed to a pair of Lundahl amorphous cobalt core 1:1 transformers to convert the signals from balanced to unbalanced. These transformers change the tone/timbre of the audio signal as little as I have ever heard a transformer do. The unbalanced signals then go directly to the volume control and on to the 12P17L gain stage. The K&K Audio Mir Line Stage Preamplifier Kit is not strictly a “newbie” kit, but can be constructed successfully by anyone with good mechanical skills and some soldering experience. You must have a suitable soldering set-up, reliable voltmeter, and appropriate hand tools, and be able to tell the difference between a resistor, a diode, and a capacitor, as well as follow detailed instructions supported with numerous detailed photographs. Included with the kit is a detailed step-by-step instruction manual (which you can ask to see in advance so that you can judge for yourself the match to your skill level). K&K Audio stands behind you as you build with telephone/e-mail support, and, if necessary, will finish/troubleshoot a complete kit for a modest time-based fee. Complete Kit (price $2049), which includes all of the parts (custom enclosure, PC board kit, output transformers, power supply magnetics, switches, jacks, volume control, etc.) necessary for a complete line stage preamplifier, except the solder, tools, and the time to assemble it. Furthermore, you can add function options to your kit as described below (now or later) to enhance its usefulness in your music system. It is also possible to have your kit professionally assembled for an additional charge.